Once per turn, Sima Zhao can show his entire hand to all players at the table if his hand card number is greater than or equal to his current health level. If all cards are the same color, he can select one card from any character and place it in his hand. If they are not one color, he can select any player and damage them. Whenever Sima Zhao's health level changes, he draws a card. 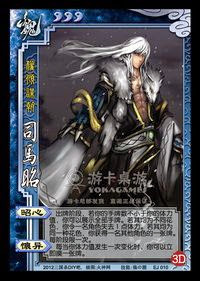 Sima Zhao can draw a card from "Unusual Presence" if he is damaged or heals. This even allows him to draw when he loses health.